OK Beckers — we’ve been working on something big for awhile now, and finally, today, we can let the cat out of the bag (this news will be everywhere soon, but we’re telling you first! ): Comcept is teaming up with publisher Deep Silver to release Mighty No. 9 this September!! First of all, yes, it is a delay from our original Spring estimate (which, from reading the comments lately, might not come as a surprise to many of you, given we’re in late April already…) But before you despair, please, hear us out first! The reason for the delay, and the reason we are so excited about this new partnership in the first place, is all the cool stuff it will allow us to add to the game (content that all Backers will get absolutely FREE): Added Japanese (yes!) and French voiceovers (in addition to English), FREE for all backers! Extra subtitle languages (Spanish! French! Italian! German! Russian! Polish! Brazilian Portuguese!) FREE for all backers! 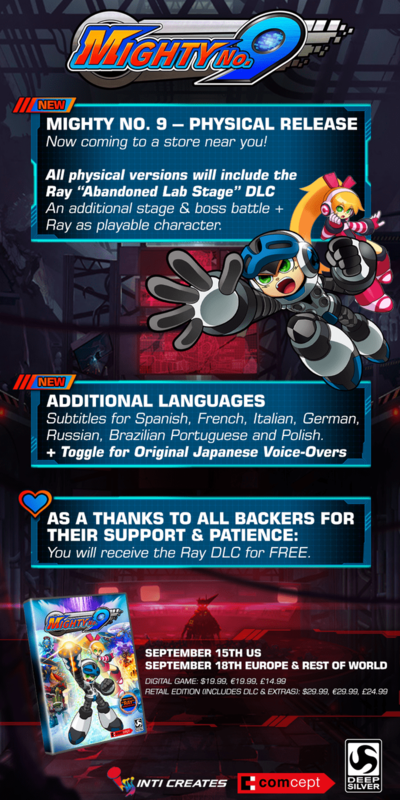 And best of all: the entire Ray DLC set — an entire extra level and boss (and playable character) — FREE for ALL backers! And that’s just the big bullet points — this deal also allows us more time and resources for testing, polish, and the creation of physical retail versions (on some systems), and — very importantly — won’t affect absolutely any of our Kickstarter plans or rewards. In short, it will make for an even Mightier No. 9, for backers, for us, and for all our fans, worldwide! We know this is a lot to take in all at once, and we know anytime a Kickstarter ends up with an outside partner some people will be skeptical, so we’ve prepared a short FAQ that goes into a bit more detail about the hows and whys. See if it answers any questions or concerns you have, and if it doesn’t, let us know! You can also check out the official press release here for more nitty-gritty details! If the FAQ and press release do not answer your question, feel free to contact us at mightyno9@comcept.jp, subject line “Mighty Publisher Question”. Here’s to a bigger, better Mighty No. 9! (`_´)?